When Petra arrives in Temperance, Wyoming, she is running away from one death and about to barrel into even more. 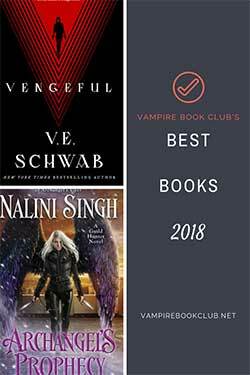 While trying to find information about her father’s disappearance years ago, Petra stumbles into a war—one of magic and alchemy and power, and one that has been going for ages. Set in current-day Wyoming, Temperance is a teeny-tiny town that just about died out when its founder died. It has been surviving on the few tourists that happen to come through on their way to Yellowstone National Park, which is where Petra’s new geologist job will have her working. There is definitely a feel of what should be an old-fashioned ghost town to it in some ways, though the county seat (where the sheriff and—presumably—the hospital are) is only about 30 miles away. Petra is an interesting character. She is strong and smart, but wounded by her past—both distant and more recent. While she is the main character, there is a pretty strong supporting cast of characters, including the coyote, Sig. (Note: All books should have a fascinating animal character. It doesn’t need to talk, though that can be fun [See: Iron Druid Series], it just needs to be awesome.) I’m hoping that I will see more of them in the future titles, particularly Maria and Frankie. Of course, based on the story, I’m certain there are a few characters that will show up again, in one form or another, and I’m curious to see if any backstory comes to play. As far as stories go, this is a fun one to read. There are a couple of inconsistencies that yanked me out of my suspension of disbelief, one being a weird kiss (no spoilers!) that felt…out of place. It also felt at times like the story couldn’t decide whether it wanted to go full-bore Western or not. However having said that, it’s a quick read, and definitely entertaining. There is some resolution to the story but there are also enough questions remaining that there was little question of a sequel. The magic system—based on the ancient belief in alchemy–is fascinating enough that I’m curious to check it out further, and there’s enough weirdness in the book to satisfy most. 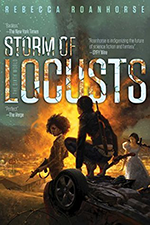 I have book two waiting for me, and to be honest I had to get this review typed up right away so I could move straight to the next one and not get confused. I will say, straight-up, that this might be one of the corniest covers I’ve ever seen and I’m thankful that the story within does NOT match the image without. However, I’ve seen the covers of books 3 and 4, and they are a marked improvement. 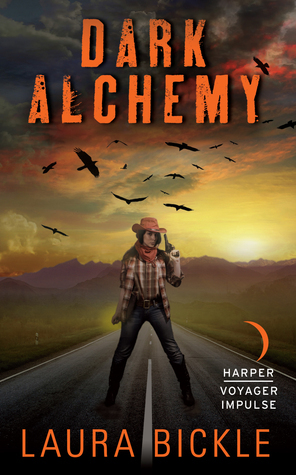 So if you like your magic with a whole lot of weird and a lean into Western territory—and with a great (and mysterious) animal sidekick–I’d say give Dark Alchemy a try!